But the 50-year-old pastor’s quiet visit to Citrus Heights on Thursday went largely unnoticed. Known to the Sacramento area’s large Slavic community for his work as a human rights activist, church leader, father to 32 adopted children and three biological children, and founder of an orphanage in southeast Ukraine, Mokhnenko sat among a small group of attendees at the Citrus Plaza Market on San Juan Avenue, telling stories of his current projects and ministry in his hometown. The informal meet-and-greet was organized by Mokhnenko, who is visiting the United States to speak at churches and raise awareness about adoption. In May, he and some of his adopted sons will begin a two-and-a-half month bicycle tour from Los Angeles to Miami, with a similar awareness goal. 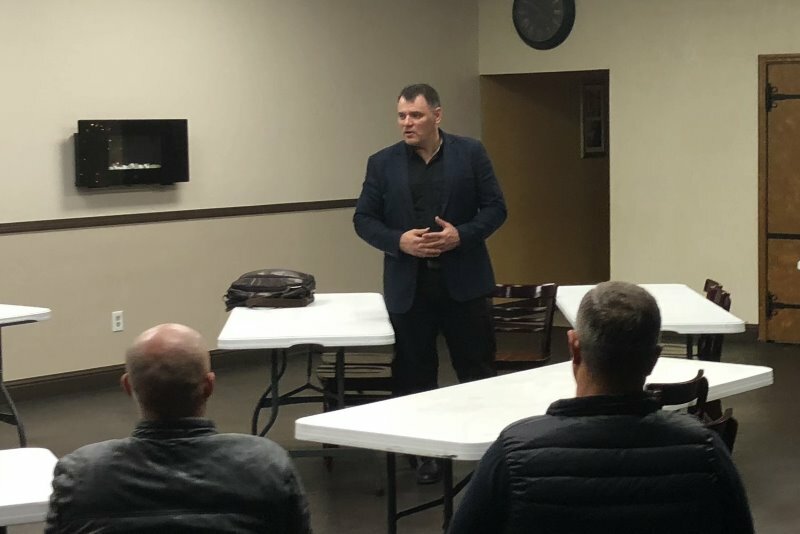 With guests seated around a table of tea and Russian sandwiches on Thursday, the pastor didn’t just share compelling stories, but highlighted daily struggles and frustrations of waging war against drugs and youth homelessness in his town. Despite addressing serious topics, his stories were interlaced with humor, characteristic of his personality. In 1992, Mokhnenko founded his church “The Church of Good Change” in Mariupol, Ukraine, which to this day is the main support for the orphanage “Pilgrim Republic,” which he founded in 2000. He now runs the largest rehabilitation program for street youth in Ukraine, according to CBN News. He defends his tough-love approach in the film, saying early intervention is the only way to keep these youth from becoming addicted to drugs or contracting AIDS. Some of the orphans shown in the film appear as young as 10 or 11 years of age, with some already addicted to drugs, often living in sewers and abandoned buildings. “People must have home, must have food, they must have family! It’s not God’s problem, it’s MY problem!” Mokhnenko says in the first scene of the trailer for Almost Holy. The documentary is professionally filmed, as one might expect with Hollywood’s Terrence Malick as one of its executive producers. Mokhnenko’s life as a pastor also entails trips to the war fronts as an army chaplain. With food supplies and a spirit of encouragement, he heads to dangerous spots of Ukraine where he offers counsel to those currently serving in the region, mostly young men. War-torn Ukraine is not only fighting off Russian forces, Mokhnenko says it’s being destroyed from within by a relentless drug trade, opium being the main sought after choice among youth. Along with corruption and abuse from government officials, Mokhnenko faces what he says are unlawful searches and seizures from local police at his orphanage, as he details on his website. Authorities also accuse him over what he called petty issues, like orphanage occupancy. “We are bursting at the seams in our orphanage that by legal requirements should hold 30 occupants, but we are up to 50 occupants currently because of a great need,” the pastor said during his Citrus Heights visit. Even with 50, he said the orphanage still can’t take everyone in need — with many more homeless youth still on the streets. Despite Mokhnenko’s founding of an orphanage, he says the ultimate goal is for such centers to disappear. To accomplish that goal, the group, including Mokhnenko, advocate for a change in thinking –where the focus is on placing children in families rather than viewing orphanages as a permanent solution.